In what appears to be a damaging snafu, US strike hits army checkpoint in Taliban stronghold region of Kabul, killing 14 soldiers. 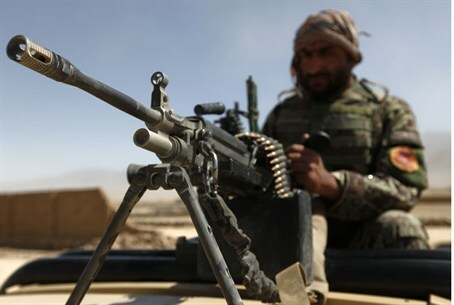 Officials in Afghanistan reported that a US airstrike early on Monday morning killed no less than 14 Afghan soldiers when it hit an army checkpoint in the southern province of Kabul, which has been a key stronghold of the Taliban. "At 6 a.m. today, two US helicopters attacked a checkpoint in Baraki Barak district of Logar province," district governor Mohammad Rahim Amin told AFP. "The checkpoint caught fire...and 14 Afghan army soldiers were killed." A US army official said he is "aware of an incident involving US forces in Logar province this morning," adding that the incident is being investigated by the US forces. The strike was confirmed by Din Mohammad Darwesh, the spokesperson of the Logar provincial governor. He claimed the checkpoint hit by the strike was "not a suspicious area," adding, "the Afghan flag was waving at the checkpoint in Baraki Barak when the Americans launched their attack." American airstrikes in Afghanistan have been a source of tension, with the Afghan government criticizing the attacks against local terrorists as they attempt to seal a peace deal with Taliban to end a long insurgency that has left thousands dead.